"Dan Widenstrom was the crew foreman. Everyone involved was..."
After noticing water damage to their foundation walls, homeowners in St. Louis Park, MN decided it was time to waterproof. Along with a waterproofing system, the home also was stabilized using PowerBraces. After receiving the home as a gift from his parents, homeowner from Minnetonka, MN, wanted to attempt to get a grant from the city for home improvements, inlcuding an energy audit. He also mentioned his wife had allergies. Before meeting with the experts at Innovative Basement Systems, he never considered the problems could be coming from his dirt crawlspace. After meeting with system design specialist, Eric Rysdam, crawlspace encapsulation with drainage matting and CleanSpace vapor barrier was recommended and installed. Another happy homeowner in Minnetonka, MN! Karen & Michael from Hopkins, MN called on TEAM Innovative to waterproof their basement. We installed a DryTrak perimeter drainage system and a SuperSump sump pump and that was all that was needed! Take the time, make the call. You'll only wished you would have done so sooner. Basement foundation bowing and basement support appears out of date/not to code. Looking to get 2 egress windows in my basements. Having some water issues in the basement. Looking for an estimate to install drain tiles and pump. Thanks! Garage floor needs replacement, crack in garage foundation needs to be examined and solution or next steps prescribed. garage is connected to a breezeway, which is connected to the house. We just moved into a home built in 1938. 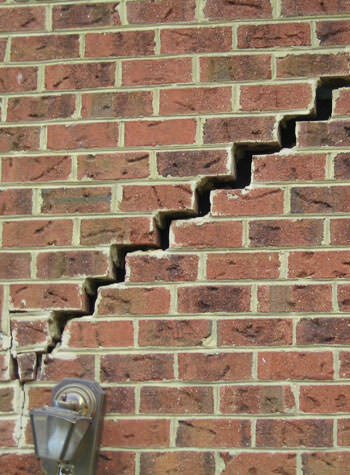 The foundation has a wall that is bowing inwards and has a substantial horizontal crack as well as stair-step cracks. It definitely has something to do with water and heaving. We need this taken care of ASAP. Please squeeze us in for a consult as early as possible. Thanks! My neighbor and I share an outdoor enclosure for our heating/ cooling units that sit on concrete slabs. Twelve years ago we mudjacked into a hole under the slabs to prevent further erosion because water had intruded into our adjacent basements. All went well until this summer's heavy rains so we believe that we need to plug the hole again with slurry or concrete or ? We have about 1/2" crack at bottom of cinder block wall in basement. Full disclaimer: I actually rent, that said I am trying to get the management of the rental to fix my window wells and may have to take them to court, but I may need an estimate cost for repairs. I will mention your quote to them when I receive it. Basically my window wells do not drain properly and the well case is positioned away from the foundation (which they tried to seal with caulking but it didn't work) I would, if at all possible, like a rough estimate of what it would cost to have the wells regravelled and a drain installed for two windows next to one another. They are standard sized privacy basement windows, not egress windows. Hello! We just put an offer on a home at 337 12th Ave N in Hopkins MN. The inspection raised some concerns with some foundation issues (ie. sagging beams in the basement, some water staining, etc) and our inspector highly recommended us to get a professional to do an inspection and a price quote. Is this something you can assist with? If so, please let me know your availability for this week. Kind regards and many thanks! PolyLevel and NexusPro join sealant. Need a price on an code compliant egress window installation for an existing house with has a basement window. Garage foundation blocks are crumbling, and in need of repair. We have a crawl space that is not in poor condition but looking to install a vapor barrier and insulation. Possibility of pouring concrete and turning the space into storage. Looking for an estimate on both projects and get advice. Large span over crawl space that is sagging in the middle. Crawl space is heated and we are looking to get repaired soon. Want to refinish our basement for more finished square footage. Need design ideas and someone to do construct the job.